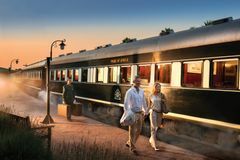 Established in 1989, Rovos Rail is one of those world class experiences not to be missed. A classic in its own right, recapture the romance and atmosphere of a by-gone era. With wood -panelled coaches refurbished to mint condition, fine dining and five star cuisine, you really will be spoilt beyond your wildest dreams. To cap it all off, you get the chance to try two different itineraries playing some of the best golf courses South Africa has to offer. Relax, sit back and enjoy the magic and mystery of Africa in the only way to travel. The "Golf Safari" starts in Pretoria and visits Sun City (play either the Lost City or the Gary Player Course), then on to the Champagne Sports Resort for 18 holes amongst the mountains. Next its off to Durban and the Country Club awaits your arrival, before moving on to Royal Swazi for another fantastic round of golf. All this is capped off by a round at Leopard Creek, voted one of the top 10 in South Africa next to the Kruger Park. As you work your way across South Africa in unparalleled comfort and style, you’ll be playing some of the country’s finest golf courses, starting at the Sun City Resort with either Gary Player Country Club or Lost City, then working your way round to Champagne Sports Golf Course, Durban Country Club, Royal Swazi Sun then finishing off at the stunning Leopard Creek Country Club, completing an absolutely world class round trip of golf. With only a maximum of 72 passengers in 36 superbly appointed suites, you will feel like you have the train to yourself. There are 3 types of suites, accommodating two people per suite in twin and double beds all with en-suite bathrooms. The Pullman and Deluxe Suites come with hot showers, whereas the Royal Suite bathrooms come with a Victorian bath and every suite combines original fittings with modern technology. Take one of two golf itineraries covering miles of landscape and plenty of golf. Alternatively try the "African Golf Collage" where you travel all the way from Pretoria to Cape Town, once again you sample some of the greatest golf possible including Leopards Creek, Durban Country Club, Humewood, Fancourt and Ernie Els course at Oubaii. Both journeys are all inclusive of some high quality food and drink along the way and each itinerary includes great options for golfers and non-golfers alike, with both being able to experience at least one game drive. Day 2 - Golfers: Morning tee off at Lost City or Gary Player Country Club. Non-golfers: 09h00 Game drive in Pilanesberg Game Reserve. Explore the Lost City followed by lunch at the club. 19h30 Dinner on board en route to Heidelberg. Day 3 - All meals enjoyed on board en route to Estcourt via Ladysmith. Day at leisure on the train. Day 4 - Golfers: Morning tee off at Champagne Sports Resort. Non-golfers: 09h00 Enjoy a professional tour of the battlefields with lunch at Spionkop Lodge followed by shopping. Depart for Durban. Day 5 - Golfers: Morning tee off at Durban Country Club/Beachwood. Non-golfers: 09h00 Disembark for a city tour of Durban followed by lunch with the golfers at the Durban Country Club. Day 6 - 06h00 Game drive in the Hluhluwe Game Reserve. 11h00 Brunch as the train departs for Mpaka, Swaziland. Day 7 - Golfers: Morning tee off at the Royal Swazi Sun. Non-golfers: 08h00 Game drive in Mkhaya Reserve. Visit Ngwenya Glass with restaurant lunch and shopping. 18h00 The train departs for Malelane in South Africa. Day 8 - Golfers: Morning tee off at Leopard Creek (dependent) on the Crocodile River. Non-golfers: 08h00 Game drive in the Kruger Park followed by lunch at Buhala Lodge and curio shopping. 19h30 Enjoy dinner on board as the train travels to Witbank for the overnight stop. Day 9 - 07h00 Enjoy breakfast as the train departs for Pretoria. 10h00 Arrive at journey’s end at Rovos Rail Station.